WASHINGTON, DC: On Thursday May 17th, 2018, the Vice President of the United States (VPOTUS), Michael R. Pence, invited NU General Secretary KH. Yahya Cholil Staquf to the White House, where they discussed the pressing need for religious freedom and for decisive action to bring this about. 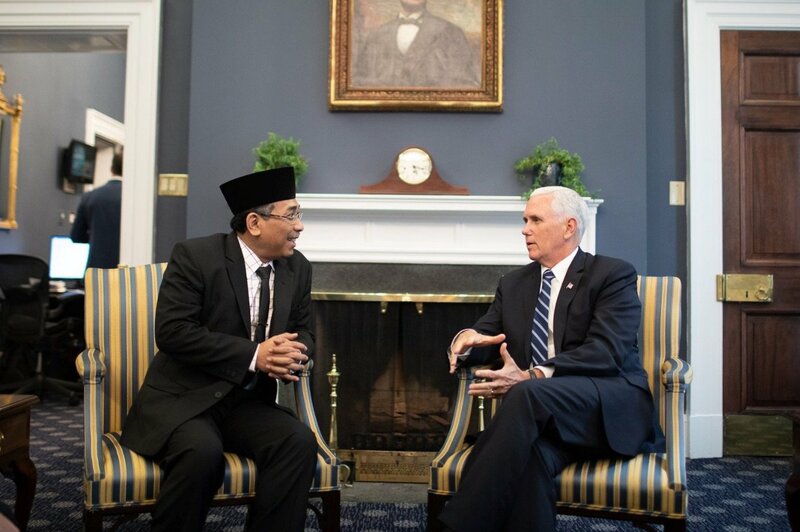 VPOTUS was accompanied by a senior advisor and by Reverend Johnnie Moore, who was recently appointed to the U.S. Commission on International Religious Freedom. Mr. Staquf was accompanied on his visit to the U.S. by C. Holland Taylor, Chairman & CEO of LibForAll Foundation and Deputy Chairman/COO of Bayt ar-Rahmah, an organization they co-founded with KH. Mustofa Bisri and F. Borden Hanes, Jr. In addition to VPOTUS, they met with Rep. Ed Royce, Chairman of the House Foreign Relations Committee and his senior Democrat colleague, Rep. Eliot Engel; Ambassador Nathan Sachs, the State Department Coordinator for Counterterrorism; Sam Brownback, U.S. Ambassador at Large for International Religious Freedom; and Archbishop Warda of Iraq’s Chaldean Catholic community, who was accompanied by Andrew Walther of the Knights of Columbus. In San Francisco, Mr. Staquf delivered a speech to the Muslim – Jewish Advisory Council of the American Jewish Committee and renewed his friendship with Rabbi David Saperstein, a close advisor to the Obama administration and former U.S. Ambassador for International Religious Freedom. In Texas, Mr. Staquf and Taylor held an extensive discussion with Dr. Bob Roberts of Northwood Church, a prominent interfaith activist with extensive ties to governments and civil society in the Middle East and Asia.